ASY TO APPLY: reLASH is a very easy to apply eyelash serum & eyebrow growth stimulator. Simply clean your face and remove all makeup and contact lenses. Apply using the brush to the base of your upper lash line every night. With double the concentration and more than twice the volume in a bottle compared to other eyelash product brands (7.4 ml/0.25 fl oz), reLASH is 4x better and lasts longer. To use as an eyebrow thickener, simply apply to your brows after cleaning. HELPS PROMOTE LONG-TERM VITALITY & STRENGTH: Unlike other lash growth treatments, reLASH helps promote the long-term vitality and strength of your lashes by helping to prevent thinning and breakage. This eyelash growth serum reinforces lash and brow durability, shine, sheen and overall healthier looking appearance by providing them with beneficial care and nourishment. Start your lash enhancement experience now. EYELASH GROWTH SERUM IS THE ANSWER TO SHORT LASHES OR THIN BROWS. reLASH is a proven eyelash serum specially formulated to help improve the appearance of longer eyelashes and fuller brows. A study conducted using the active ingredient shows over 60% increase in lash length and density in just 4-6 weeks of use. This eyelash enhancer nourishes your lash line with protein complexes to reinforce and support a healthier looking appearance. Start enjoying the appearance of fuller, longer and more luscious lashes and fuller eyebrows within a few weeks with the best eyelash enhancing serum! PERFECT ALTERNATIVE TO FALSE LASHES & EYEBROWS: reLASH is the perfect alternative to false eyelash extensions and fake eyebrows. Now you don't have to spend money on lash extensions nor spend lengthy time in front of a mirror messing with applicators, eyelash glue, adhesives, sealants and other eyebrow & eyelash extension supplies. By using eyelash growth products such as reLASH you will never have to worry about fake eyelashes ever again. Watch your natural lashes grow healthier and forget about any other lash conditioner. 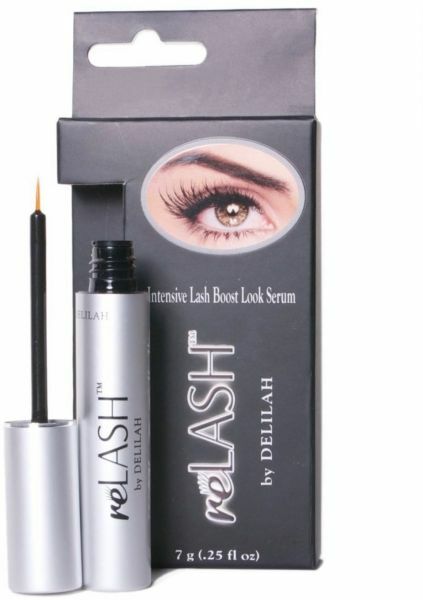 If you are looking for a great eyelash growth stimulator, you cannot go wrong with reLASH. We are so confident that you will LOVE it , people might very well ask what is the secret to your good looking longer lashes. Start enhancing your look right now by purchasing reLASH. Don't forget to purchase an extra bottle as a gift for your friends or family.